Team Epic « Big Squid RC – RC Car and Truck News, Reviews, Videos, and More! You are browsing the "Team Epic" tag archive. 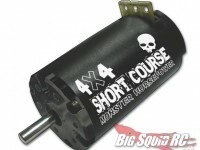 Team Epic has a new 550 Short Course Brushless Motor. It has a 5mm shaft, fits all 2wd and 4wd SC trucks, and is supposed to have more power for those heavier SC vehicles. Comes in 4.5, 5.5, and 6.5 turn. Check out the Team Epic web site for more info.